Soloist, chamber musician, and teacher, Jack Sanders’ performances have included the Sitka Summer Music Festival, Kapalua Music Festival of Hawaii, Arrowhead Bach Festival, and solo appearances with numerous orchestras, including the Illinois Chamber Orchestra, Chamber Orchestra of Santa Fe, Modesto Symphony, Orange County Chamber Orchestra and South Coast Symphony. He has performed with the St. Petersburg, Colorado, and Angeles String Quartets, the vocal group I Cantori, and the contemporary chamber ensemble XTET. Radio appearances have included NPR’s nationally broadcast "West Coast Live." In 1984 Jack Sanders formed a duo with violinist Clayton Haslop which has since appeared at Guitar Foundation of America Festivals, Merkin Hall in New York, the Oregon Bach Festival and in concerts from Hawaii and Alaska to Maine. The Haslop/Sanders Duo has toured for the California Arts Council, and a 1988 tour of China included the Shanghai Conservatory, where Mr. Sanders was the first U.S. guitarist to appear after the Cultural Revolution. The Duo has recorded for Centaur Records and Townhall Records. A solo recording by Mr. Sanders featuring the Preludes of Ponce, Villa-Lobos and Carlevaro was released by Townhall Records in the Spring of 2000. Mr. Sanders also performs with oboist Allan Vogel and flutist Janice Tipton in the Valencia Trio which has appeared at the International Music Festival of Costa Rica and the Sedona Chamber Music Festival. Equally at home performing music of all periods, he gave the American premiere of Micio Mamiya’s Sacred Spells for Guitar. Works written for him include Anthony Plog’s Animial Ditties for Guitar and Narrator, Karl Kohn’s Soliloquy, Tripartita, Concords (violin/guitar), Colla Voce (viola/guitar), and Frank Campo’s Two Studies (trumpet/guitar) which he has recorded for Crystal Records. In 1996 he gave the first performances of Las Folios D’Espana, a concerto by Louis Moyse and in January, 1999 he gave the U.S. premiere of Raymond Luedeke’s Elemental Dances with the Colorado String Quartet. In 2005, Mr. Sanders gave the premier performances of Music in Four Sharps for guitar and string quartet by Ian Krouse. 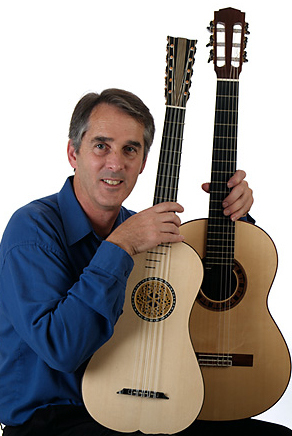 An accomplished luthier, Mr. Sanders builds classical and flamenco guitars, as well as historic reproductions of vihuelas and 19th Century instruments. A faculty member of Pomona College since 1980, he has also taught guitar-building courses at California Institute of the Arts and Pomona College. He received his BFA and MFA degrees from California Institute of the Arts, and has served on the Board of Directors of the Guitar Foundation of America since 1995.